Never mind what you learned in school, Europe isn’t really a continent, it’s just the westernmost part of the landmass of Eurasia. It’s above all an idea that has been in flux since the time of Herodotus. 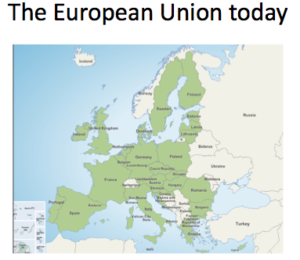 60 years ago, Europe became an Economic Community, joined by Greece in 1981, and later, in 1993, it became the European Union with broader purposes. It pioneeered the euro currency in 1999, which Greece adopted in 2001. Economic and political union hasn’t been easy, and it may not last (witness Brexit), but (with the exception of a contained fire in the Balkans in the 1990s), the center has held. Greece, dangling down there in the SE corner, is both at the periphery (the strategic periphery) and – thanks to ancient Athens – also at the center of the Europe. As we in this country know so well, e pluribus unum is forever a work in progress. The majority of Greeks want to remain in the EU. Whether they’ll retain the common currency is another matter.